This week will be a light week for Two at the Table as we are very excited to travel to Austin, Texas to spend Christmas with Kim’s parents. 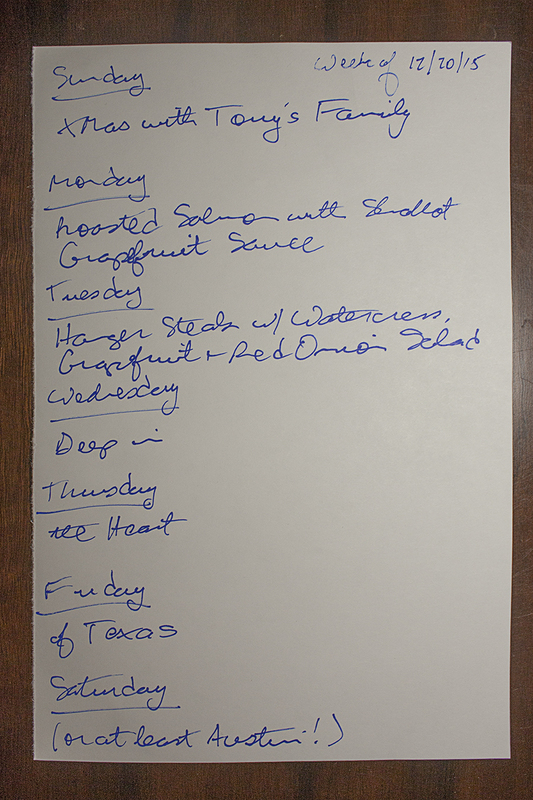 This week’s menu is also inspired by one of their early Christmas gifts to Kim and Tony–a box of delicious Texas Ruby Red grapefruits. Kim loves them and is so excited to make two recipes where they can be featured. Many, many thanks to Kim’s parents for this tasty treat. On Sunday, we will be celebrating Christmas with Tony’s family along with toasting to his mom’s birthday, which falls on this day. We’ll have all kinds of Italian goodness–antipasto, pasta, roasted pork loin–and of course, birthday cake. To give Tony’s mom a break, he and his sister are going to do all the cooking…with assistance where needed from Kim. Monday night, we are making a recipe we’ve made a few times from one of our Ellie Krieger cookbooks and really enjoy…Roasted Salmon with Shallot Grapefruit Sauce. It’s a flavorful and easy weeknight meal. The grapefruit is an excellent combination with the salmon and the basil adds a nice touch of brightness. Tuesday night is a new recipe: Hangar Steaks with Watercress, Grapefruit and Red Onion. This should be an interesting contrast to the recipe we are making on Monday night. After that we are off to Austin to enjoy the holidays and spend time with friends and family–we can’t wait!